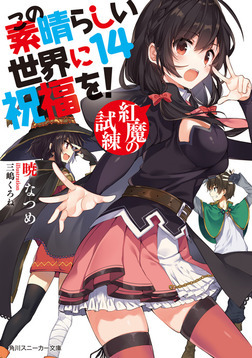 An anime movie adaptation has been announced for the light novel series Kono Subarashii Sekai ni Shukufuku wo!. The announcement also revealed that J.C.Staff will produce the movie, unlike the two TV anime adaptations which were animated by Studio Deen. More details will be announced at a later date. Kono Subarashii Sekai ni Shukufuku wo! is a fantasy light novel series written by Natsume Akatsuki and illustrated by Kurone Mishima. The series has been publishing since 2013 and just released its 14th volume (pictured) on July 1. It has received various anime adaptations, as well as a manga adaptation, and four spin-off titles. Yen Press has licensed both the light novel series and the manga series in 2016 and 2017, respectively, for North American release. Most people confuse overrating with overpopularity, for example the poor SAO is a victim of this problem. Nor is there overrating, only people who do not know how to qualify fairly, like me. Yaaaaaas! I’m going to give my Megumin pillow some loving. Better than nothing I guess... I'm expecting that the movie will adapt the spin-off LNs that's tied with the plot of the main storyline. How do I delete somebody else's comment? I hope Kazuma's party will get better. i love konosuba but I don't have hopes for this film, the story probably won't be great but the characters are so amazing i'm just happy that I get to see them in a new thing. An interesting turn of events. Let us hope this new studio can provide the humorous entertaining adaption the previous one did.